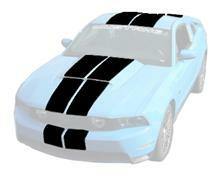 Give your S197 a race inspired look with Late Model Restoration's 2010-2014 Mustang stripe kits. These Boss style hood stripes and LeMans stripes come in black, silver, and white to give your Mustang an aggressive new look. These Mustang racing strip kits fit 2010, 2011, 2012, 2013, and 2014 Mustangs. Add classic looks to your 10-14 Mustang with a stripe kit from Latemodel Restoration. These black, silver, and white stripe kits are the perfect addition to any Mustang.